The saga of Ollie and Moritz continues in this sequel to the highly-praised debut novel from Leah Thomas, Because You’ll Never Meet Me. I didn’t think BYNMM needed a sequel so I went into this with some trepidation because the world of Ollie and Moritz was already so special and important. But I can say that Nowhere Near You is just as special and important, maybe even more so. If you haven’t read BYNMM, I don’t think it’s necessary but it does help create an immediate sense of story. Ollie enthusiastically embarks on a road trip to find other kids like him and Moritz, the “Blunderkids.” These are kids with unique characteristics, such as Ollie’s allergy to electricity and Moritz’s eyelessness. Meanwhile, Moritz attends an exclusive school despite his antisocial tendencies. The journey for both boys is heart-breaking, hilarious, and shocking. 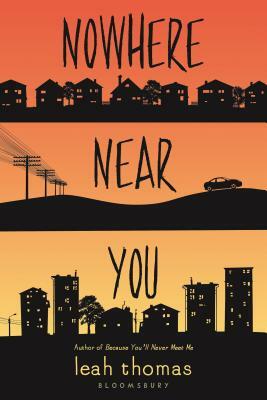 Nowhere Near You is a quirky contemporary science fiction take on the importance of friendship and identity. Another standout from Thomas. Ollie and Moritz might never meet, but their friendship knows no bounds. Their letters carry on as Ollie embarks on his first road trip away from the woods--no easy feat for a boy allergic to electricity--and Moritz decides which new school would best suit an eyeless boy who prefers to be alone. Along the way they meet other teens like them, other products of strange science who lead seemingly normal lives in ways Ollie and Moritz never imagined possible: A boy who jokes about his atypical skeleton; an aspiring actress who hides a strange deformity; a track star whose abnormal heart propels her to victory. Suddenly the future feels wide open for two former hermits. But even as Ollie and Moritz dare to enjoy life, they can't escape their past, which threatens to destroy any progress they've made. Can these boys ever find their place in a world that might never understand them? Leah Thomas frequently loses battles of wits against her students and her stories. When she's not huddled in cafes, she's usually at home pricking her fingers in service of cosplay. Leah lives in San Diego, California and is the author of Nowhere Near You and the William C. Morris YA Debut Award finalist, Because You'll Never Meet Me.